While a newly arrived trauma patient is still in the scanner being imaged, you look over the radiographer’s shoulder to see the CT head images that are up on the screen. Q1. What does the CT head show? The CT brain shows a right-sided lesion with hypodensities in addition to a predominantly hyper-dense lesion in a convex pattern between the skull and the brain. There is significant mass effect resulting in midline shift with subfalcine herniation. The patient was prophylactically warfarinised for atrial fibrillation and was rapidly scanned in less than one hour after onset of symptoms. There was no history to suggest a previous (chronic) subdural haematoma. Q2. How is the age of the haemorrhage determined on CT Head? 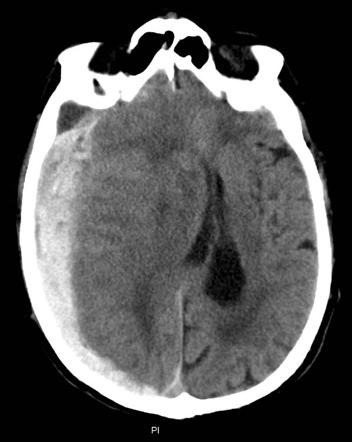 When CTs are performed rapidly after onset of the bleed (within an hour or so), the “hyperacute” blood can appear isodense to the brain, with a swirled appearance (mixture of clot, serum and unclotted blood). The “acute” component of the bleed is hyperdense. This is typical of a bleed less than 3 days old. Subacute blood is typically isodense with brain tissue, and has this appearance from 3 to 21 days post-haemorrhage. Beyond this time, chronic subdural haemorrhages are hypodense.